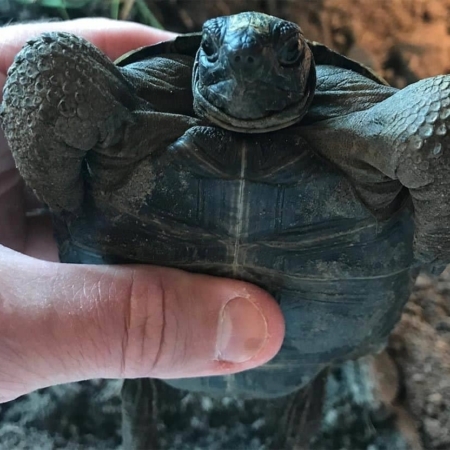 Giant Aldabra tortoise for sale online baby aldabra tortoises for sale online aldabra tortoise breeder of giant aldabra tortoises sale near me. Aldabra tortoises’ carapace (or upper shell) has a small neck plate that is usually visible, a feature absent in other species of giant tortoises. The males have a concave plastron (belly shell) that aids in mating. 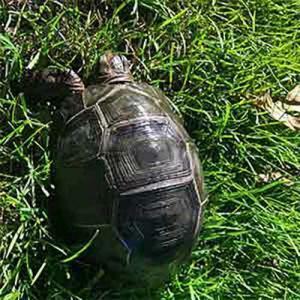 They are dark gray to black in color with a highly domed, thick carapace. They have long necks, which helps with food gathering. The hind legs are cylindrical and columnar like those of an elephant; thick, often bony scales cover them. The toes are short and two-jointed. The head is relatively small, pointed and covered by scales. Aldabras are one of the world’s largest land tortoises. Males are considerably larger than females and have longer, thicker tails. The male’s carapace length can measure 4 feet (1.22 meters) and they can weigh up to 550 pounds (250 kilograms). The female’s carapace can measure 3 feet (91 centimeters) and can weigh 350 pounds (159 kilograms). An Aldabra tortoise weighing 672 pounds (305 kilograms) is the world’s largest free-roaming tortoise ever recorded. Aldabra Island is a coral atoll bordered by jagged limestone and small beaches and encloses a large mangrove-bordered lagoon. The tortoises live in habitats such as scrub, mangrove swamp and coastal dunes. The largest concentration of tortoises is found in the grasslands called platins. Baby Aldabra tortoise for sale are often imported as captive bred hatchling Aldabra tortoises for sale. The Giant Aldabra tortoise is the largest animal on the Aldabra Island atoll. It fills a similar role to the one occupied by elephants in Africa and Asia. As with elephants, they are the main consumers of vegetation and will noticeably alter the habitat during their search for food. Mature adult Giant Aldabra Tortoises have been known to knock over small trees and shrubs to obtain nutritious leaves. Seeds pass through the tortoise’s digestive tract and eventually become food for many other species. They can reach ages of more than 100 years. It is believed that tortoises are the longest lived of all animals although is hard to prove because they have outlived the scientists who were studying them, and proper records were not kept. The Aldabra tortoises on exhibit at the Smithsonian’s National Zoo are about 80 years old. This is a guess because they arrived at the Zoo as adults. One pair arrived in 1956 and the second in 1976. CB Reptile also known as “Captive Bred Reptiles, Inc” is a company that was born based on the foundation of only offering captive bred reptiles for sale, online. At CB Reptile, our goal is to not just offer quality reptiles for sale, online. Our goal and our mission is to offer the BEST geckos for sale. The highest quality and most colorful chameleons for sale. Some of the nicest ball python morphs you’ve ever seen are offered right here, at CB reptile. CB Reptile breeds many species of gecko, iguana, turtles, tortoises, chameleons, tegus and more. Our goal is not just to be reptile breeders, but to offer the highest quality specimens for sale in the USA. At CBReptile.com all of our reptiles for sale online, including our geckos for sale are 100% captive bred and NOT wild caught. We have a Biologist ON SITE and offer a Live arrival and FULL 7-day health guarantee on ALL Of our animals. Our guarantee extends to 30 days for all customers who purchase full habitat kits. All of our orders ship via UPS or FedEx Overnight in heated or cooled, insulated containers (when needed) and leave our facility at 6:45 PM and are on your doorstep the following morning before noon. One Shipping charge of $39.95 covers up to 5 reptiles for sale.